The phoenix, in Chinese and Japanese mythology, has always been considered a good omen. 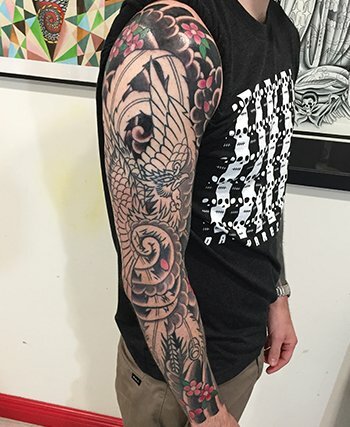 When Sean first contacted me about getting a full Phoenix sleeve this was definitely the case. Good fortune was on the horizon. Sean reached me through email which is usually the case for most of my new clients. 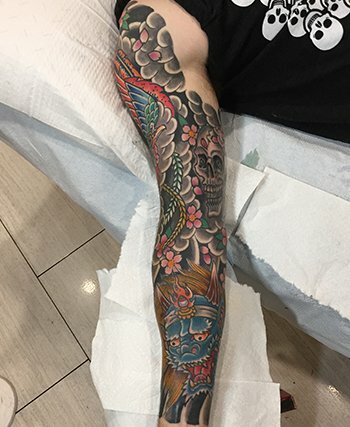 When he mentioned that he was interested in a traditional Japanese sleeve, I was immediately on board. The traditional Japanese style is one that I have always had a very deep appreciation for. As a matter of fact, most of my personal body suit is in the Japanese style. 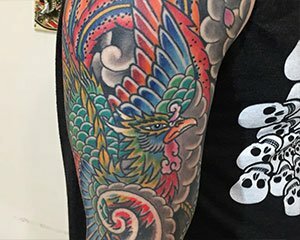 You can see the Japanese influence in almost every modern tattoo style. The Japanese were the first to pioneer the use of large scale foreground imagery, combined with a cohesive background and theme throughout the entire body suit. 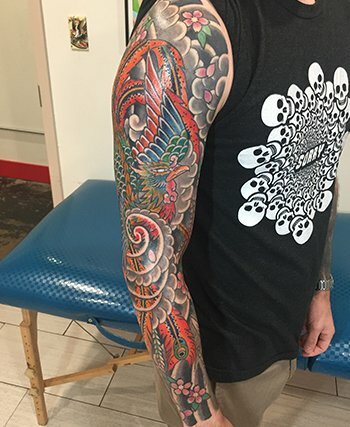 His original concept for his sleeve was to combine the following elements: Phoenix, Oni demon, skull, cherry blossoms, chrysanthemums, wind, and water. After hearing his ideas, I felt there were several design issues that needed to be addressed. So, I offered, as I usually do, my professional opinion. I asked if he wouldn’t mind some advice, and work in collaboration on the design. Although he had already done extensive research and planning, Sean was glad to accept. Typically in a Japanese design, there is an order to combining certain elements. You normally would not have an Oni or skull paired with the sacred Phoenix. Also, it is best to limit the number of floral accents to one specific flower for aesthetic reasons. My idea was this; phoenix, wind, cherry blossom, Fujin god of wind, and a skull lurking in the distant shadows. 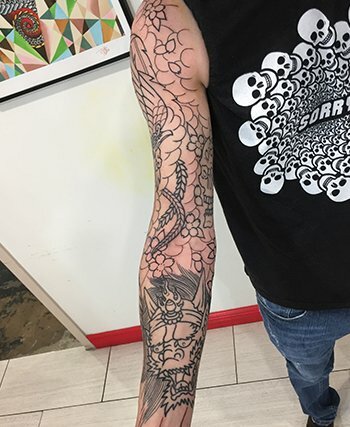 An entire arm seems like an awful lot of space, but I knew that trying to put too much imagery would diminish the overall impact of the piece. Because the Phoenix is king of all birds in the sky it is always paired with wind and cherry blossoms. You would normally not see a phoenix surrounded by water. It is also very uncommon to see a phoenix paired with an Oni. They are typically seen in an underworld buddhist hell scene. They are servants to the god of the underworld, Emma-O. However, in Japanese mythology, the Oni are not inherently malevolent. And in the ancient Shinto religion, there are two Gods, Fujin and Rajin, who take the form of blue and red Oni. My idea was to use the inner forearm for Fujin God of Wind. The last issue was to address the idea of the skull. This is also an unusual pairing with the sacred bird. However, it is not unusual to see skull and cherry blossom together. The cherry blossom and skull are both symbols of our own mortality. The cherry blossom represents the transience of life. Most flowers wilt and fall, but the cherry blossom falls in full bloom. This is a reminder to us of our short time here, and impermanence of life and everything around us. The skull in the east has several meanings. In pairing with the Cherry Blossom, the skull also represents the embrace of our own mortality. Fortunately Sean was excited about my ideas and we quickly set up his several appointments. He was not impatient to wait a couple months for his first appointment and sent over his deposit promptly. Soon enough his first appointment was approaching. Normally, for a sleeve project, I will sit down at my drawing table about a week before the first appointment and start the drawing process. I dig through my personal reference catalog and retrieve my best materials for inspiration. The best and most unique inspiration comes from imagery that is not easily found on social media. And as a tip, if looking for online references, NEVER TYPE IN THE WORD TATTOO! 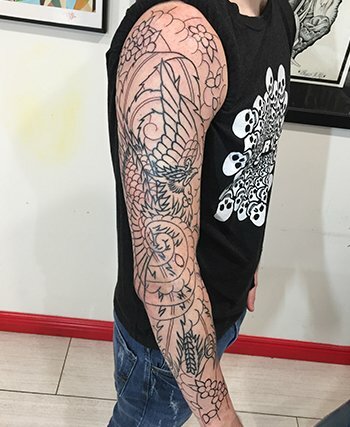 When Sean came in for his first session, I had the designs ready for the Phoenix, Fujin, and skull. Sean was very happy with the drawings and we were soon applying stencil to skin. The first session would include outline of the foreground subject matter and extra time for the stencil process. Placement of image is very important at this stage of the tattoo. We worked the first night for about three hours. 3 to 4 weeks later Sean came in for his second tattoo appointment. This session would require an hour or so for freehand application of the background imagery as well as some fine detailing in the foreground. The actual tattooing this night took us about 2 1/2 hours. 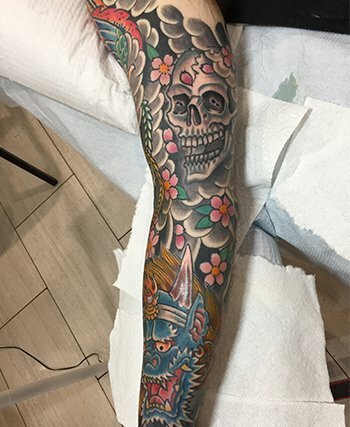 The third and fourth appointments would wrap up background shading and color of blossoms. Depending on the size of the individual and the detail of the imagery, the steps could take longer. But Sean is a relatively average sized person and he sat like a champ! So these sessions seemed to breeze by. Roughly 3 hours each. The fifth session was our longest. 3 1/2 hours of solid tattooing to color in the sacred bird! Sean sat great as usual with good conversation and no complaints! 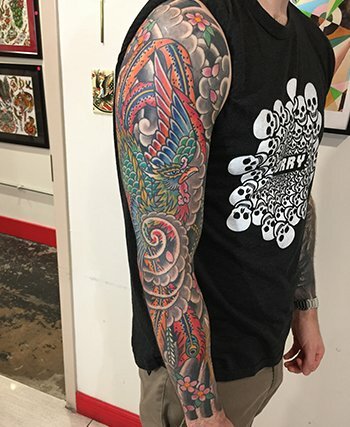 When he came in for the sixth and final color session I saw that the Phoenix had healed beautifully from the previous appointment. We had an easy 2 1/2 to finish up the remaining color in the Wind God and our hidden skull. In an ideal world everything runs smooth and easy like Sean’s sleeve, which seemed blessed by the good omen of the Phoenix from the beginning. I wanted to take the time to write about an ideal day in my world. I am thankful for all of my clientele. Thank you for your trust, patience, and open mind. One side note, if you’ve read this far and you don’t mind spending five more minutes on the Internet, please feel free to comment below and leave me a review on Google. Wow, awesome read and powerful imagery! 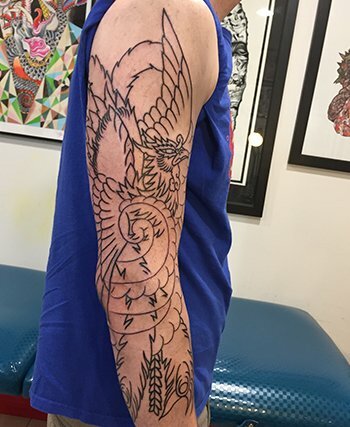 It was really cool to learn about the mythology of the phoenix, hear about the process, and see this sleeve come to life. Thanks for sharing the information and showing dedication to your craft. I’ve left a Google review as a small token of my appreciation and look forward to the next article!